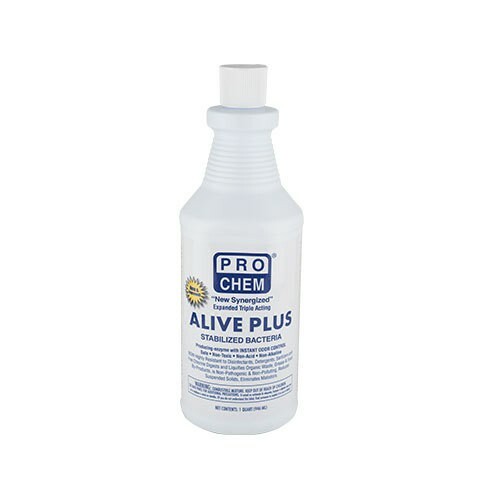 ALIVE PLUS | Pro Chem, Inc. ALIVE PLUS contains a synergistic blend of engineered bacterial strains for effective removal of various organic soils. It is fortified with free enzymes and detergents. 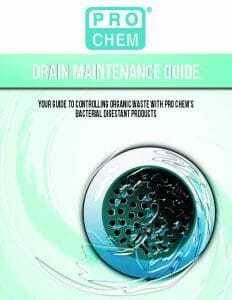 It utilizes the natural ability of unique bacterial strains to degrade the solid waste that accumulates in grease traps, drain lines and sewage plants. ALIVE PLUS is an excellent odor counteractant that can be sprayed on fabrics, carpets or hard surfaces to eliminate the bacteria that cause odor. The product eliminates odors caused from pet waste, urine, bodily fluids and more. It contains four strains of the bacillus bacteria. They are Bacillus laevolacticus, Bacillus licheniformis, Bacillus amyloliquefaciens and Bacillus pasteuril. Grease Traps: Use 8 to 20 ounces per drain of product daily depending on the size of the grease trap, type of cooking, cleaning procedures and volume. Used properly, this product will drastically reduce costly pumping charges and BOD wastewater surcharges. For a 2000 gal capacity system, initial recommended dosage would be approximately 4 gallon, (1000 gal capacity system, initial recommended dosage would be approximately 2 gallons). Then you should use approximately 1 gal per each 1000 gals of daily flow, split between each entry point. So if, as an example, your total daily flow is 1000 gals, you’d use approximately 20 oz. in each drain. Drain Pipes: For slow drains: Pour 4 to 8 oz. of product in drain. Let stand overnight. Repeat in two or three days. If drain has not improved, check for obstruction. To prevent slow drains: pour 4 to 6 oz. down each shower drain, lavatory, kitchen sink or commode once each month. This amount should be doubled for septic tanks. Lift Stations: Treat directly as the well fills and add at least 3-5 gallons per million gallons of flow capacity. Repeat with one-gallon treatment per week as a preventative maintenance program to maintain an odor-free system. Septic Tanks: Add 1 quart for initial treatment. Use 8 oz. per week thereafter by flushing down commode. Portable Toilets: Add 1 gallon directly to toilet and cover solids with water to aid digestion. Repeat procedure every time the toilet is pumped. For odors related to urine, pet waste, or other bodily fluid: If soiled area has been treated with chemicals, such as carpet spotters, etc., rinse thoroughly with water to remove all chemicals. Mist area with ALIVE PLUS. Allow to dry. No rinsing necessary. Maintenance: Use 1 gallon per million gallons of flow.